We told you yesterday that Android 2.3 started rolling out to the Samsung Replenish on Sprint, and now it looks like the eco-friendly handset is coming to one of Sprint's pay-as-you-go carriers, Boost Mobile. Boost announced the handset this morning, and while it's not a game-changing device in terms of spec, it does have a nice price tag: $99. No contract. You can't beat that with a stick. Like I said, it's not a game changer. However, for $99 without contract, it's still quite a good deal. The Replenish will be available on January 16th in Boost's retail stores, select independent wireless dealers, and online with free shipping. IRVINE, Calif. – Boost Mobile, ranked Highest in Customer Service Performance and Purchase Experience among Non-Contract Wireless Providers by J.D. Power and Associates1, starts off the New Year with a new eco-friendly Android™ smartphone, Samsung Replenish™. 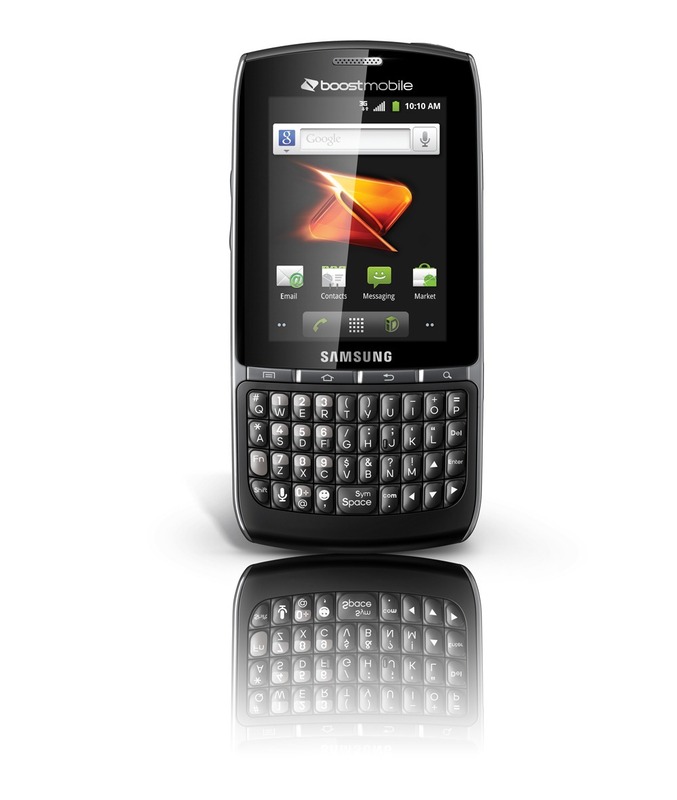 An Android touch/QWERTY smartphone enabled with Mobile ID, Samsung Replenish will be available Jan. 16 and is Boost Mobile’s first Android priced less than $100. Samsung Replenish, Boost Mobile’s first eco-friendly2 Android smartphone, is partially built with recycled plastics3 and is the ideal choice for the environmentally conscious consumer who wants the latest technology with a no-contract offer on a dependable nationwide network. Boost Customers can get additional “green benefit” by simply trading in their old device as part of Boost Mobile’s new Buyback program or by simply making on-time payments with Boost Mobile’s $55 Android Monthly Unlimited plan with Shrinkage. For every six on-time payments, a Boost Mobile customer’s monthly cost will shrink by $5, eventually getting down to as low as $40 a month for unlimited nationwide talk, text, Web, email, and calls to 411. Payments do not need to be consecutive to qualify for these savings milestones. Samsung Replenish will be available Jan. 16 for $99.99 (excluding taxes) at Boost Mobile’s exclusive retail stores, select independent wireless dealer locations across the country, and atwww.boostmobile.com with free shipping. Samsung Replenish will be available in additional national retailers by the end of the February. Customers can save even more money with Boost Mobile’s new Buyback Program, which allows customers to trade in an old device in exchange for an account credit. Ineligible devices can still be sent back for proper recycling. For details and a full list of devices and their values, visit http://buyback.boostmobile.com. Samsung Replenish also comes preloaded with Mobile ID, an exclusive service from Boost that allows customers to download and install “ID packs.” The packs deliver a complete mobile experience, including applications, widgets, ringtones and wallpapers, in a few simple clicks. ID packs are designed to meet a customer’s individual lifestyle or interests, such as sports, entertainment, fitness and music. ID packs that can be loaded on the device include MTV Music Pack, E!, Socially Connected, Professional, Entertainment, Lo2Yo Latino, Lo2Yo Mujer and Lo2Yo Futbol. Additionally, Samsung Replenish features Boost Zone, a centralized place on the device where Boost Mobile customers can access their account, pay their bill, get assistance with their phone, and stay up-to-date on Boost Mobile’s products and services. Boost Zone will be coming soon to all Boost Mobile CDMA Android devices.